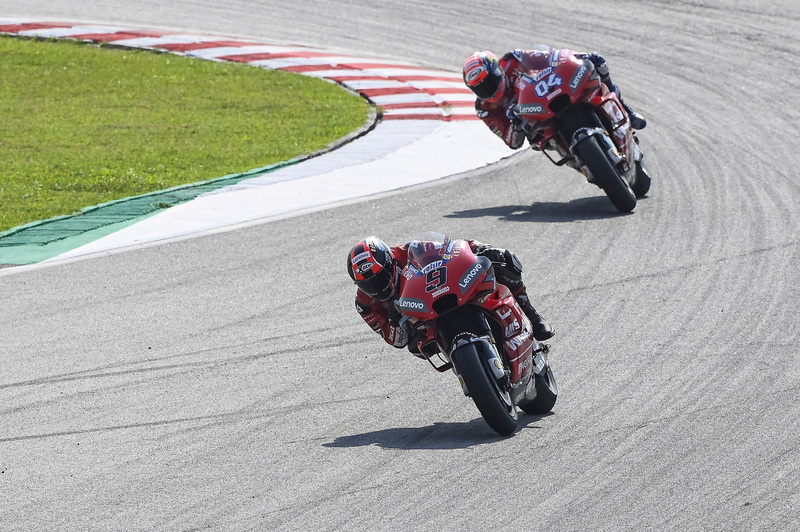 MotoGP 2019 testing got underway this week and, as ever, was full of intrigue, with rookies impressing and factories unveiling some interesting innovations, visible and otherwise. It was Ducati who ended the test on top, with a lockout of the top four on the final day, including a new unofficial track record for Danilo Petrucci with a 1’58.239, over half a second clear of Jorge Lorenzo’s previous track record from the Sepang test last year, and interestingly set without the FUBAR rear brake attachment. That lap from Lorenzo just over one year ago was performed on an early version of the Ducati GP18, the bike from which Pecco Bagnaia’s bike for 2019 is derived (Bagnaia is riding the latest version of the GP18, from the 2018 Valencia GP), and with that bike Bagnaia managed to go just 0.063 seconds shy of Petrucci’s time. Whilst Bagnaia was keen to play himself down, emphasising that he needs to work on his race pace this early speed is surely a positive sign going forward. Ducati brought out some interesting things on the second two days of the test, with Andrea Dovizioso – who ended up fourth on the final day behind Jack Miller who was third – debuting a handlebar widget on the second day, thought to be a ‘holeshot device’ the compresses the front suspension on starts to decrease wheelie when launching. On the final day we saw Ducati’s new aero fairing, a three-winged affair which was destroyed on his first lap out of the pits by Danilo Petrucci. Dovizioso suffered no similar fate, but Ducati will be after more data, of course, in Qatar in a few days’ time. Maverick Vinales was the best non-Ducati rider on the final day of the test – 0.4 seconds from Petrucci – after topping day two. Despite his deficit to the headline time, the consensus amongst the riders seems to be that Vinales is one of – if not the – strongest on pace from this test, and this supports his positive view of Yamaha’s winter development. 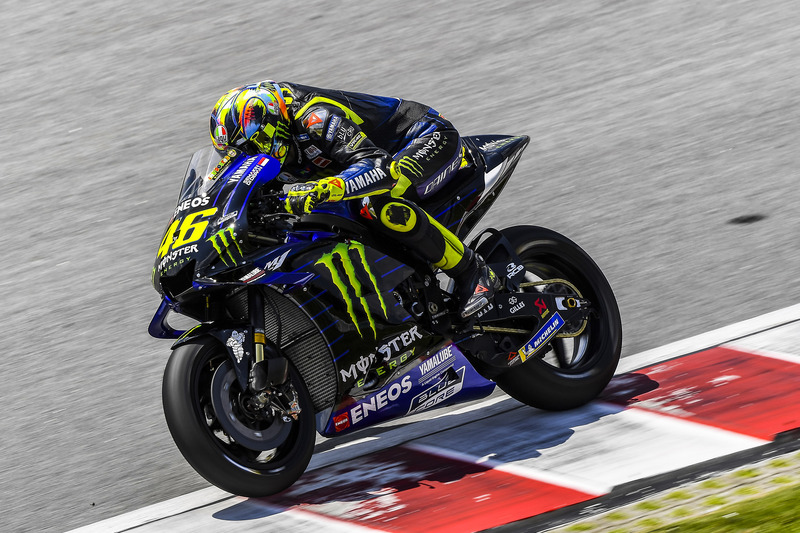 Valentino Rossi’s report is less extreme but positive nonetheless, the Italian encouraged by the signs he sees from Yamaha itself, sensing that the factory is keen to return to the front on a regular basis this season. But still, The Doctor wants more from Yamaha, he doesn’t feel he has enough to win at the moment. Valentino Rossi on the YZR-M1 at Sepang preseason testing. Across both factoy riders and Petronas SRT pilot Franco Morbidelli, the main complaint remains acceleration, with all three feeling they are still losing out on corner exit, especially in comparison with the Ducatis. Most of the new additions to the M1 in this test were internal, and the riders were mostly reluctant to speak about that which we could not see. 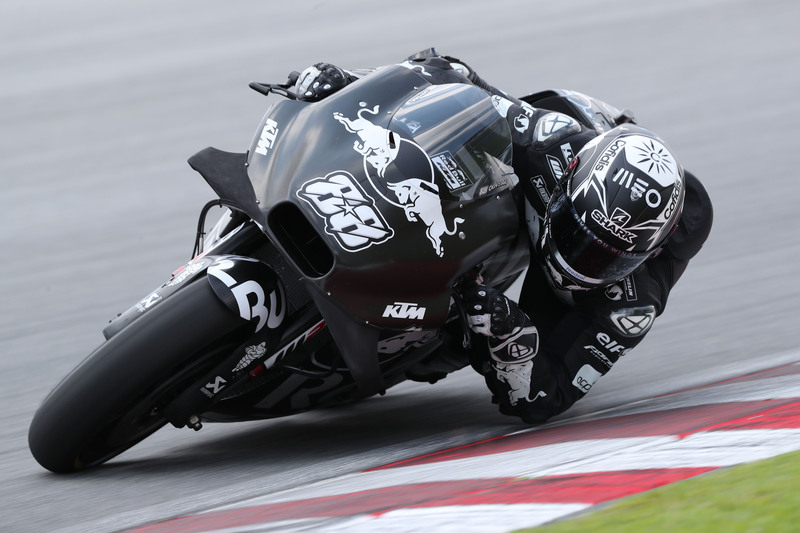 One thing which was visible on the M1 in Sepang was a new fairing, which came out of the box on Friday. Like Ducati, Yamaha will be after confirmation on their findings from Sepang in the final preseason test in Qatar, and Rossi confessed it is unlikely there will be anything new to try between now and March 10. There were only two Hondas in the top ten on the final day in Malaysia, the LCR machines of Cal Crutchlow (6th, +0.541) and Takaaki Nakagami (9th, +0.909), whilst Marc Marquez could only manage 11th, 0.931 seconds off Petrucci. After topping the first day with alarming speed and consistency, the blistering speed largely deserted Marquez for the remainder of the test, as he tried to evaluate the new items Honda had brought to Sepang despite his weakened physical condition. It was always set up to be a tough test for Honda with three of their five riders injured, and Jorge Lorenzo to such an extent that he was absent, all of which made the work of Stefan Bradl all the more crucial, as the German test rider focussed largely on long runs. Despite their difficulties, which will largely remain unalleviated in Qatar (both for the test and the race), the feeling is the Honda is ready for winning, and the onus is still very much on the opposition to Marquez to make as much advantage in this period where he is not at 100%. A twelfth place for Alex Rins on the third day seems initially quite underwhelming, but looking at the average times of all the riders, it is #42 who comes out on top. Suzuki had their engine design confirmed for 2019 before Sepang, so the test in Malaysia was just about the details. The biggest/most obvious additions to the GSX-RR in Sepang were a new aero fairing – essentially a slimmed-down version of what they had last year – and a new, shorter exhaust, designed to give the Suzuki a little more top end. As well as the impressive pace shown throughout the three days by Rins, Joan Mir ended the test as the second-fastest rookie, in fifteenth place and 1.247 seconds from the top time. KTM had a decent test, with an impressive time coming from Pol Espargaro on the first day, followed by good progress from both Johann Zarco and Miguel Oliveira on days two and three. After the first day, Zarco was left wondering how long he might have to wait to receive the parts he felt he needed to allow the RC16 to suit him, and on the final day he was the top KTM in 17th, a tenth clear of Espargaro (18th); 1.4 seconds off the top. This progress will come as a relief to Zarco, who up to the first day in Malaysia looked to be struggling to adapt to the Austrian bike. A similar thing can be said for Oliveira, who was 19th and three tenths shy of Zarco. On the other hand, Hafizh Syahrin still seems to be struggling to adapt to the KTM after a year on the Yamaha and ended the test as the slowest of the full-time riders and down in 21st place, 2.5 seconds from Petrucci. Aprilia decided, that 2018 did not happen when designing the 2019 RSGP, and it was a decision much to the delight of Aleix Espargaro, who was happy with the bike from when he jumped on it in the shakedown test preceding the official MotoGP test. There is still a lot of work to do in Noale for the engineers, but the seventh fastest time for Aleix on the final day shows they are in the right direction. Unfortunately for Andrea Iannone the test was not as positive, as it was marred by a dental infection for the Italian. Either way the #29 was able to get his hands on the new RSGP for the first time after sampling the Aprilia itself for the first time back in November. He and his team will hope he can be back to full strength in time for the Qatar test in a few days. Featured image courtesy of ducati.